The diagram shows the main internal parts of the assembly. O :- The entire housing contains oil for its electrical insulating and thermal cooling properties. N :- A rubber diaphragm allows the oil to expand and contract without increasing the internal pressure. T: - X-ray tube body is wholly contained in the assembly housing except for the window where the x-rays emerge. K :- Two cathode heaters are provided. Each have different electron beam properties. A :- Target anode. 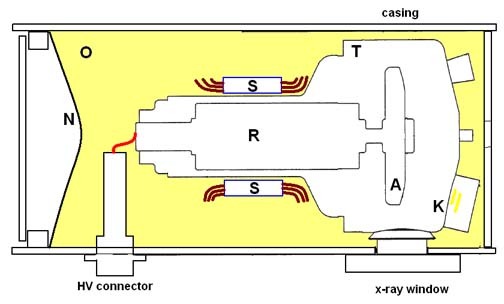 The anode in most modern x-ray tubes rotate. 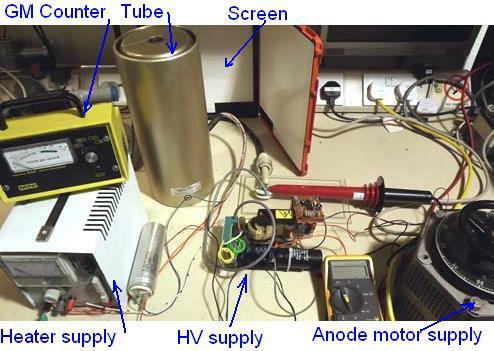 This reduces the affect of heating on the anode surface by the incident electron beam. R :- The rotor and bearings are part of the anode assembly and are fully contained inside the evacuated X-ray tube body. S :- Stator coils are mounted on the outside of the tube. Their magnetic field drives the rotor and therefore spins the anode when operational. 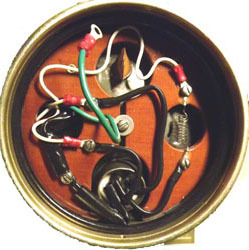 The image shown lower right looks into the cathode end of the X-ray tube enclosure with the cover removed. With the oil drained the terminals and wires connecting the heaters can be seen on the tube support frame. 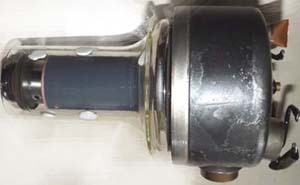 The upper right picture is of the tube removed from the housing. Note the lead covering around the anode. The video link shows how the complete unit is disassembled. The x-ray tube assembly shown above is designed for the comparatively low anode voltage of less than 40kV. The anode is also made from a slightly softer alloy than many other tubes. The x-rays produced are slightly less penetrating and designed for tissue imaging rather than bone structures. 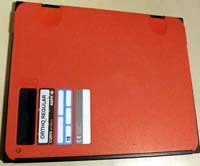 A typical x-ray film case is shown below. These are light tight to protect the film. Although x-rays will fog photographic film this process is much enhanced by using fluorescing plates one either side of the film. 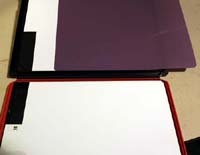 The two white sheets shown in the open case are in fact phosphorescing plates that emit visible light when excited by x-rays. This increases the exposure of the film or reduces the x-ray dose required to create an image. Not all fluorescing materials which work with UV light work with x-rays. In fact these sheets will not fluoresce with long-wave UV but will with short-wave UV. The fluorescing plates can be used for x-ray detection and real-time imaging. The arrangement below shows a test set-up. X-ray levels vary over a wide spectrum and become more penetrating with increased anode voltage. At low energy levels glass is quite opaque to x-rays hence the use of Beryllium windows in tubes. There are some videos around showing speckle patterns on the picture when exposed to x-rays. Note that the energy levels used in this experiment are not capable of this. It is important to remember that all x-ray emissions should be considered dangerous. In this arrangement the anode voltage and current are minimised. The tube assembly has internal lead shielding. Operating time is minimised. A Geiger counter is also in operation close to the tube housing to monitor leaking radiation levels. It is also worth mentioning that G-M tubes are not the most sensitive detector for x-rays and scintillating detectors would be better. The picture below is of the set-up and the phosphor screen with a "memory stick" in front of the tube.